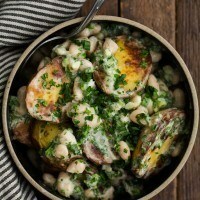 Braised Potato Salad with White Beans | Naturally.Braised Potato Salad with White Beans | Naturally. Cut the potatoes in half, lengthwise. Place cut side down in a non-stick skillet (I used a well-seasoned cast iron skillet). Add the water, garlic cloves, butter, and salt. Bring to a simmer over medium heat, cover, and let potatoes cook until just tender, 12 to 15 minutes. Uncover, remove and save the garlic, turn up the heat to medium-high, and cook, swirling the pan often to keep the potatoes from sticking. Water should evaporate and butter should start to sizzle. Cook, checking the bottoms of the potatoes occasionally, until the potatoes have a golden crust on the cut side, 15 minutes or so. Transfer to a medium bowl. In a small bowl, mash the cooked garlic into a paste. Add in the ingredients for the dressing and stir well. Add the beans and scallions to the bowl with the potatoes. Stir in the dressing and toss until everything is well combined. + Braised potato method from America’s Test Kitchen. + This dish is best served right away as the potatoes will not stay crisp. If looking to serve this later, plan on a more traditional potato salad where you allow the potatoes to cool, combine everything, and the potatoes have no crispness to them.